Google said late Friday that its Nest connected-home division had agreed to purchase Dropcam in a deal that will extend Google's control into the home even further. 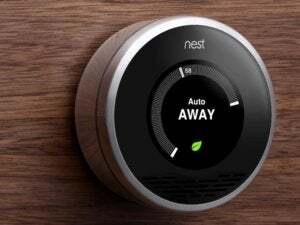 Google and Nest did not disclose the terms of the deal, although reports, including The Wall Street Journal, said that the sale price was $555 million. Dropcam, according to Nest, allows consumers to "check in" on their homes while they're away. The company's wirelessly controlled cameras bill themselves as cheap, unobtrusive security systems, allowing either Android or iOS users to remotely peek at what the camera sees from afar. "Eventually, the plan is for us to work together to reinvent products that will help shape the future of the conscious home and bring our shared vision to more and more people around the world," Matt Rogers, the founder of Nest, said in a blog post. Interestingly, the deal was announced on the Nest blog, and in writing it, Rogers intimated that Nest had made the deal, not Google. (The $3.2 billion deal by which Google acquired Nest closed in February.) Whether this implies that Nest's leadership, including Tony Fadell, has its own shopping budget isn't known. But as Nest builds the "conscious home," perhaps other deals are in the offing.